Before we can tell you why you should come to Metfab Metals to fulfill all your AESS needs, let’s define this term-of-art accurately. For those unfamiliar with this acronym “AESS”, it is Architecturally Exposed Structural Steel, and includes finely-finished steel members (prepped, welded, filled, blasted, polished, and/or uniquely painted/finished) to be installed so that it is permanently open to the view and touch by all after the job is done. All of us in the construction industry are well-advised to understand this concept better as there are “categories” of this finish which greatly vary the work required----and therefore the cost. This Guide (see footnote #1 below) was developed to facilitate better communication among architects, engineers and fabricators. It was felt that visual references would help all parties understand the intent of the new AESS documents as applied to the design of structures. AESS work, though structural, is never covered by sheetrock or otherwise hidden from public view. During construction, or even after the structure is complete, at any floor level or at ground level, one can walk up to this steel member, examine it, touch it, see all its perfection or imperfections [as either can be specified per one of the five (5) categories (grades) of AESS commonly available, and detailed in the manual referenced in footnote #1.]. Since then, we have become highly sophisticated at such specialty AESS work on many small to medium-sized projects, as well as several high-profile jobs, such as New York City’s new World Trade Center, the National Museum of African American History & Culture (“NMAAHC”) in Washington, DC and the expanded VCU Medical School in Richmond. Our COO & founder, Jim Murray, has been an integral part of many early AESS projects in the New York City area, as well as around this country. 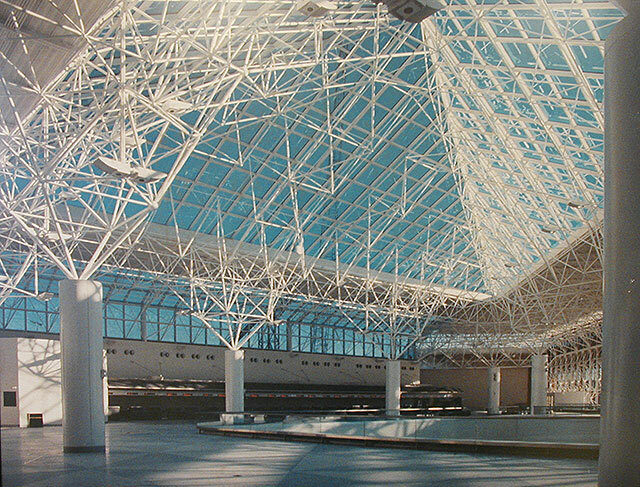 At BWI Thurgood Marshall Airport , even today you can yet see the structural steel space frame (at the ceiling level) with its threads, pipes and connections in plain view-------- and still shining in its original fabricated & installed condition two decades after erection! Since then Jim Murray, has overseen AESS jobs as varied as the American Jewish Heritage Museum (delivered in the early 2000’s) in Philadelphia and the unique “roof ladder” coverage of an interior courtyard at 51 Louisiana in Washington, DC or the Borgata Casino outside entrance overhang (“Porte Cochere”) in Atlantic City, NJ. The new World Trade Center (WTC4) at the restored Ground Zero in NYC) and the even-newer VCU School of Medicine (Virginia Commonwealth University) are grander and more striking examples of this evolving art-form and this architectural aesthetic. Metfab Metals is rightly proud to have done the AESS components for all these signature projects. We cannot here on a website page recite all that General Contractors or Curtainwall Suppliers/Erectors or even the Design Teams themselves must necessarily require of the chosen fabricator when AESS has been specified. To effectively execute these AESS contracts, actual shop fabricating is only part of the fabricator’s role. Just glance at the 50-page “Guide” cited above (or the also-excellent AISC guide cited below) and you can get a flavor of all that you will need your selected fabricator to undertake to get the AESS to your jobsite in the pristine condition always specified. A few examples should suffice. A well-informed fabricator such as Metfab Metals must, among other things, first review the job specs themselves to be sure the “category” of AESS (there are five usually) chosen is what the design team really wants; verify it will best serve the aesthetics of the structure; confirm that it fits the budget of the project and; and finally be certain it’s truly what the Owner envisions. [Frankly, these factors are more often in conflict than you might imagine.] After that (sometimes even as part of those initial discussions), the finish and coatings can still be in dispute and need an experienced hand to interject the real-world factors that might well argue in favor of one particular option or another. The broad spectrum of options for the finish and coatings are too often not covered precisely enough---even in the best or very precise specs. Beyond that, there are considerations such as which type of connections are to be chosen, curves and cuts that make the job optimal and finally shipping and erection considerations. Absent years of practical experience, a seemingly good option is prone to error----or just plain confounding to the actual site problems. Too often lost in this morass of issues is the one that can break all erection timelines and the one we always insist on focusing the design team to: delivery. Actually this is not a single issue. To put it as briefly as we can here in this space, just look again at what AESS is: “finely-finished steel members (prepped, welded, filled, blasted, polished, and/or uniquely painted/finished) to be permanently open to the view and touch of all…..” To say this requires special handling from A to Z is to understate it greatly and, candidly, to misstate the actuality. Each AESS part must be moved, wrapped, secured, and prepared for delivery in a most careful way so that the pristine “fabrication with spec’d finish” that leaves our shop is the one that stands at the often-remote jobsite after erection. On this issue alone, there is simply no substitute for experience. Our experience on any of these issues is why Metfab Metals is your best choice for AESS. In 2015—and into 2016—we commenced two new AESS jobs with creative new applications of this aesthetic at Hudson Yards in New York City and at a new high-rise commercial building (multi-storeys of curtainwall) a few blocks away. In researching what was needed to satisfy the specs on these jobs, we went back to several resources (including the above-cited Canadian manual) for very helpful metrics and examples to pass along to the Design Teams, as well as our customers. Don’t forget that Jim Murray always offers you his personal AESS expertise FREE to you—new customer or an established one--- at the job concept stage to anticipate issues before fabrication, to suggest better ways to order, extrude, cut, drill, paint, finish, even stage and deliver and always to save time and money. For further illustrations of the range of AESS work we have done, look at the various pages of this website. (Our archived 10+ years of Newsletters also often illustrate this). Call Us; We Have All the AESS Answers! 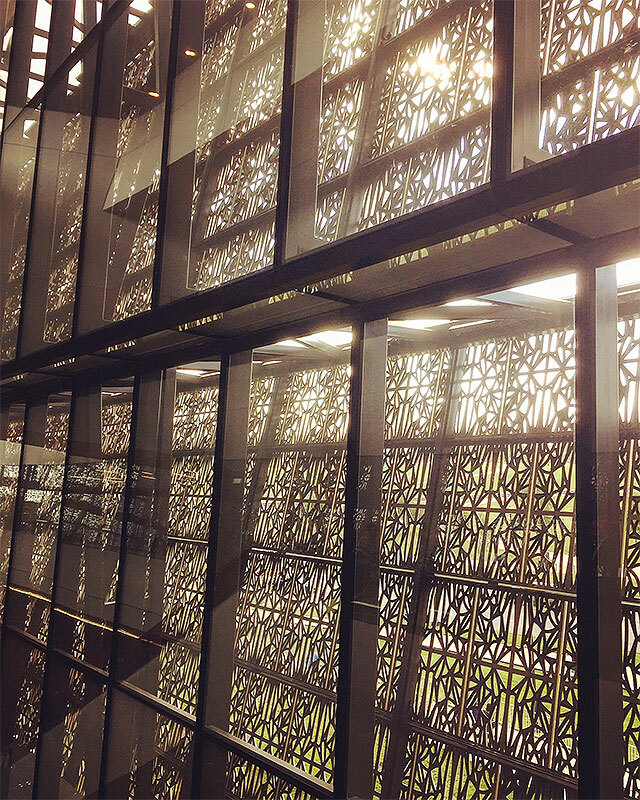 [Inside the finished NMAAHC museum as it appears for the Grand Opening on September 24, 2016. 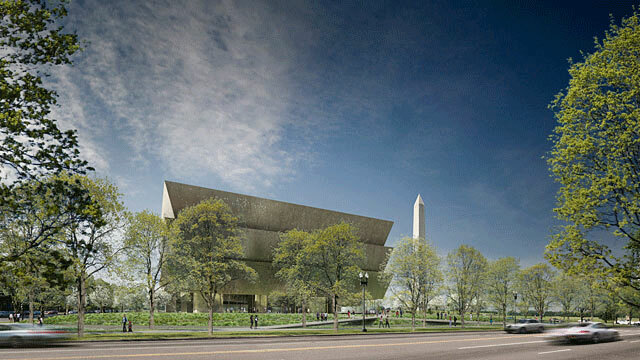 Our AESS frames support the unique webbed exterior of this bronze-colored museum]. CISC Guide for Specifying Architecturally Exposed Structural Steel, Canadian Institute of Steel Construction, 2012, 2nd Edition, Page 7, primarily authored by Terri Meyer Boake, , B.E.S., B. Arch., M. Arch., LEED AP. We are grateful to her and this resource for all its very useful insights and clarity. This is a useful tool in both explaining this art, as well as drawing accurate specifications. See picture at end of this page herein. Again---See picture at end of this page herein. For another outstanding professional manual on AESS, the American Institute of Steel Construction (AISC) has one. Go to www.aisc.org. This resource too can take you through all the concerns and issues you must consider in specifying and then executing AESS fabrications. "Fabricator of Steel Parts and Assemblies for Building Envelopes.....and MORE!"